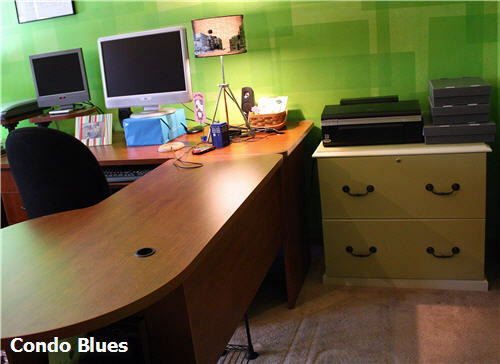 Condo Blues: I Organized My Office! Clutter makes me cranky. Which made it easy to pick a project when Apartment Guide asked me to participate in their Holiday Home Organization Blogger Challenge. I was sitting at it. Apartment Guide gave me a budget of $150 dollars for my project. I spent a chunk of the budget on repainting and repairing a thrift store wood filing cabinet to replace the flimsy little guy in the office. Good call on that one because the drawer front snapped off when I opened the drawer on the old cabinet to clean it out for the last time. I can't tell you how happy I was when I chucked that baby into the city recycling bin! I wasn’t sure where to start, what records I need to keep, and what old paperwork I could shred. 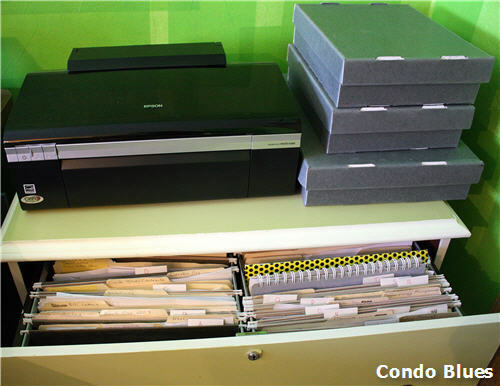 I found Organizing Your Apartment Office and Organize Your Desk Drawers on Apartment Guide helpful. As well as their tips on how to hide holiday surprises with limited storage space because that pile of junk was the perfect place to hide Husband’s Christmas gifts. I’m not proud of that but it’s the truth. Turns out there were a lot of old records and such I could shred/recycle. I ended up with SEVEN kitchen trash bags full of shredded documents. Shredded paper fibers are too small for city recycling so it’s landfill bound. *cringe* I'm not too thrilled about that. At least I bought compostable trash bags this time because our landfill recaptures the methane the bags give off when they break down to make electricity and power city vehicles. I’m trying not to feel bad about it but seeing a rare overflowing garbage can at the end of my driveway on trash day still gives me the willies. 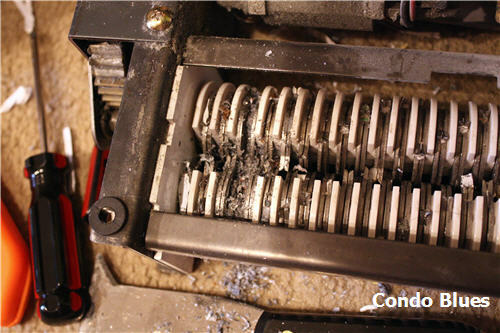 I shredded so much stuff that I broke our paper shredder. After years of both Husband and I sometimes cramming too many sheets of paper into the shredder over the years, it stopped running. I took it apart, cleaned it, and tried to repair the bent cutting wheels. No luck. I had to replace it, which was an unexpected hit on my project budget. To compensate, I nixed the shelves I planned to build and hang above the filing cabinet which may have turned out for the best. Now that I can get to the closet more easily, I realize I could probably store what I planned to store on the new shelves in the closet if I gave the closet a good cleanout too. That would be a free to me project, people! I likes me that price. I still went over budget because I still needed to buy a second set of hanging file racks, more hanging file folders, and an Adams Tax Preparation Organizer for my freelance and blog business paperwork. It's a great organizational tool. Husband and I use one tool for our household taxes. Basically, it’s a binder with a series of labeled pockets for the receipts and records you need to keep for tax time. It is a thousand times better than using a shoe box. While I waited for the new shredder to ship (at 4’11” there’s no way I could go into the Black Friday weekend fray and expect to make it out with all of my body parts intact), I finally transferred the photos from the ancient computer to a flash drive. I wiped the hard drive and packed the computer and monitor up to donate to Free Geek Columbus. I rehomed the two suitcases to the guest room where Husband can work on his project of preserving his family's old papers and photos in archival boxes. I took the opportunity to pretty up my desktop too. I wrapped the stack of old phone books I use as a monitor riser with wrapping paper. The basket was a housewarming gift. It holds business cards. The little TARDIS police box is the USB hub Husband gave me for my birthday. I can see my desktop! I knew it was there somewhere! They say the cheapest way to redecorate a room is to paint it. 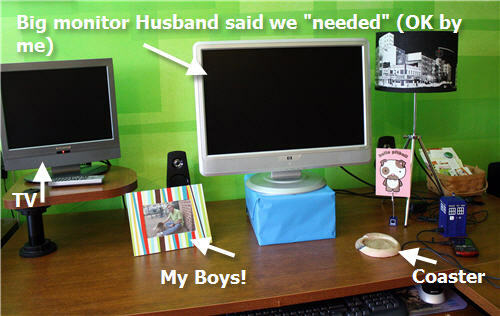 I say that the cheapest way to redecorate a room is to clean it up and get rid of the clutter! For more decorating and organizing tips that work whether you live in an apartment or not, you can follow Apartment Guide on Twitter (if you tweet to them using the #OfficeHours hashtag they can help you narrow down your apartment search) and friend Apartment Guide on Facebook. Disclosure: Apartment Guide is owned by Consumer Source, Inc. 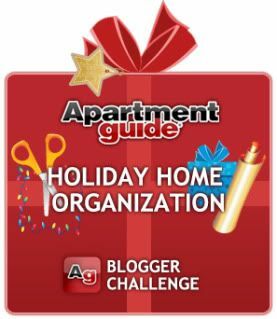 Apartment Guide partnered with bloggers such as me to participate in its “Holiday Home Organization” Blogger Challenge. As part of that program, I received compensation. They did not tell me what to purchase or what to say about the products used for the “Holiday Home Organization” Blogger Challenge. Apartment Guide and Consumer Source believe that consumers and bloggers are free to form their own opinions and share them in their own words. Consumer Source’s policies align with WOMMA Ethics Code, FTC guidelines and social media engagement recommendations. Looks good, congratulations! 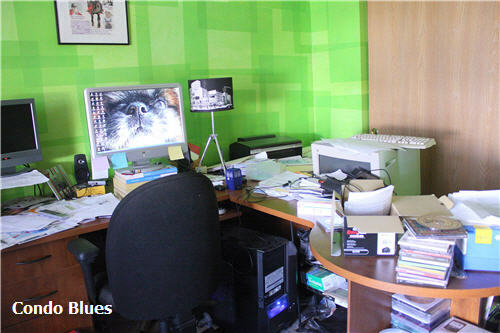 I am a neat freak, so it gives me pleasure to see a room so beautifully transformed. You must feel awesome! Looks great Lisa!! Now I better jump on the bandwagon!